David Braben is quite clearly excited about what Frontier are creating in the planetary landing-focused Horizons expansion for Elite: Dangerous. 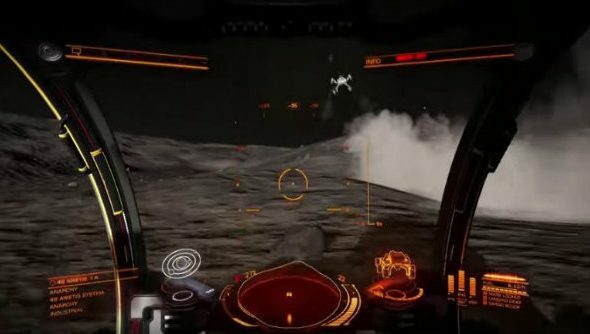 It was only the other day when he shared an early build video showing off the scale of a planet, and now he’s teasing us with moon buggy racing across a rocky planet’s surface. Some teases have been coming in-game, too. Players have recently uncovered a new mystery in Elite: Dangerous, and apparently it’s “just the beginning”. This latest tease shows us two buggies zipping across a dusty rock for half a minute. The driving looks like bumpy fun, and one of the vehicles even performs some sort of mid air rocket boost after accelerating up a hill. Yes. The footage was captured straight from a dev machine – using a GTX 770 – and takes place on a rocky moon “somewhere between Earth and Mars in size”. If you’re wondering why the video cuts at a strange point, apparently the drivers were about to come up on something that they’re not ready to reveal yet. It seems there will be more than just rocks on this moon, Oh David, you tease.